Bognor forced a Nyewood Lane replay against Bracknell in the FA Trophy with a late strike by Bradley Lethbridge saving the team hopes of progressing in the competition. 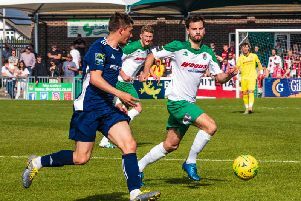 Bognor faced their Bostik south central hosts without Jimmy Wild, who is struggling with tonsillitis, and Joe Dandy, Keaton Wood, Corey Heath and Dan Smith, all injured. Liam Ferdinand struck one wide of the post from long distance in the first minute for Bracknell but it was never going to trouble Dan Lincoln. Then James McClurg did well to cut the ball square to Adam Cornell but he struck it wide along the deck. Mason Walsh set the Rocks on the attack down the left before crossing for Lethbridge who rose high and headed the ball against the crossbar on five minutes. Jimmy Muitt received a through ball before going one on one with Mark Scott, who denied him. Then Joe Grant's shot was blocked. The Rocks hit the bar again when Joe Tomlinson’s cross fell to Tommy Scutt, who lashed it against the woodwork from just inside the by box. On ten minutes Seb Bowerman curled a shot goalwards from outside the box but Lincoln was equal to it. Dave Hancock headed away a Walsh cross from the left before the Robins scored the opener on 20 minutes. A square pass to Ferdinand saw the defence stand off him before his lot show went beyond the diving Lincoln. Lethbridge was denied twice from tight angles, then Muitt's cross couldn’t be reached by Walsh. Bognor equalised on 33 minutes and it was Calvin Davies who hit a nice chipped pass to Muitt over the defence. Muitt did enough to beat Hancock and compose himself before slotting the ball coolly beyond the goalkeeper. Walsh was booked for simulation on 38 minutes as he sprung on the attack, while Muitt was denied with a long-range strike after good work from Walsh. But a slip by Davies allowed McClurg in and he struck it first time into the net on 42 minutes. Bognor should have equalised again on 43 minutes when Tomlinson crossed along the floor for Lethbridge but his attempt was denied by the legs of goalkeeper Scott. Walsh crossed from the left but Muitt diverted it over on 49 minutes. McClurg had a talking-to from the referee after a challenge by Walsh but no cards were shown before Cornell fizzed a strike agonisingly wide for Bracknell. Tomlinson received a pass from Lethbridge before unleashing a low shot across the goal, but Scott did well to push it round the post. Grant received a through ball before striking it hard at goal but Lincoln denied him on 60 minutes. Johnny Hathaway's cross found Ferdinand who headed it back inside but Lincoln gathered. Rocks won a free-kick from a late challenge in front of the box. Tomlinson's shot rose over the wall and forced Scott into a diving save. Ash Artwell replaced the impressive Joe Grant on 74 minutes. Ferdinand ran through the middle but was blocked by Lincoln when the defence were left standing. Rocks sub Joshua McCormick replaced Walsh on 82 minutes and Kensley Maloney replaced Bowerman a minute later for the hosts. Chad Field pumped a ball forward which bounced to Harvey Whyte but he scuffed his chance straight at Scott on 85 minutes. McCormick's ball fell to Lethbridge but his goalbound touch was cut out by Scott. It looked over for Bognor but after winning a free-kick in the third added minute through Whyte, the ball fell kindly for Lethbridge, who rounded two players before belting the ball high into the net to give Rocks a replay. It will be on Tuesday night - ko 7.45pm.